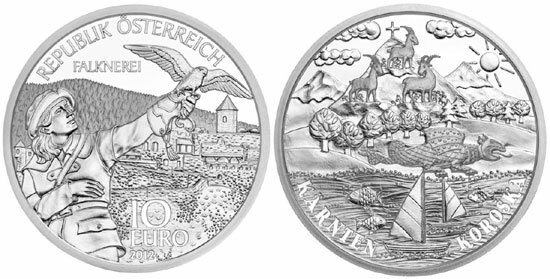 The Mint of Austria have released the second silver coin in their delightful “Austria by Its Children” series. This coin series continues to celebrate what Austrian children are excited by, and proud to speak about, when they speak of their home. The second coin features a design by 10 year old Philip Ogris, who is a native of the province of Carinthia. Philip’s design was selected from about 1,200 designs submitted by 9 and 10 year old children living in the province of Carinthia. The selection committee reviewing all the anonymous submissions included officials and coin experts from Carinthia. The other side of the coin features a UNESCO world heritage site located in the home province of the child from which the design was selected. On the obverse, Philip included many of the well-known sites of Carinthia. In the foreground is the lovely and popular summer destination, the Woerthersee. Sailboats and fish are floating in the clear waters of the lake. The lake is correctly depicted south of the snow-covered Alps, more specifically the mountain of Grossglockner, with a brilliant sun shining in the background. Between the lake and the Alps the ever popular Lindworm of Klagenfurt is depicted. A luscious forest and striking ibexes stand proudly on the mountainside. Carinthia shares it southern border with the country of Slovenia and thus many of its citizens speak Slovenian as well as German. Because of this Philip decided to include the name of the province in both the German and Slovenian languages along the bottom inside edge of the coin’s design. The reverse side of the coin was designed and engraved by the mint’s chief engraver Thomas Pesendorfer. Thomas depicted the falconer wearing the very thick leather falconer’s glove, raising his hand as the falcon takes off for full flight. The outfit worn by the falconer is a blend of traditional and contemporary falconry clothing. In the background are the ruins of the castle of Landskron located north-east of the city of Villach in Carinthia. Even today regular falconry events occur on the castle grounds. The castle has been known in a variety of forms since 1351. The text “REPUBLIK OSTERREICH” is placed just above the primary design and the coin’s face value of “10 EURO” is seen just to the right of the Falconer figure. The silver Carinthia coin will be available in two qualities, Proof and Uncirculated, with a maximum mintage of 30,000 and 40,000 respectively. The coins are struck in sterling silver with a weight of 17.3 grams and a diameter of 32 mm.